At work you will get restrictions. Maybe because you are surfing too much in the Internet during your working time? Also privately the present day does not look good for you. Your wishes have to be postponed for a time. Walk proudly through the bottleneck, which lies in front of you. It is a difficult time in your relationship. Reticence and inhibitions are on both sides. It occurs to you, as if everything is too close. Perhaps a little time out, like a holiday with a good friend, would be a good idea. 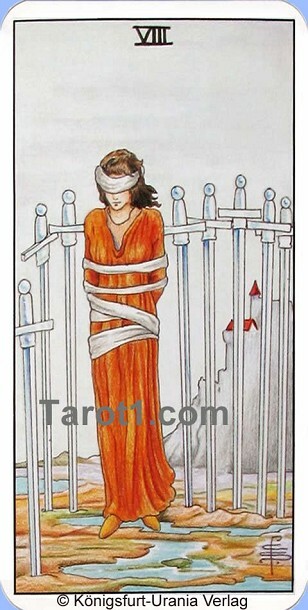 On this Tarot card is a bound woman with blindfold standing on a wet level in front of a castle. This tarot card is representing our inner and outer shackles, that we have created ourselves. The woman represents inhibitions and restrictions.